In the industrial production sector, more and more manufacturers need to find a reliable sensor technology to monitor each stage of the assembly process when manufacturing safety-related components. 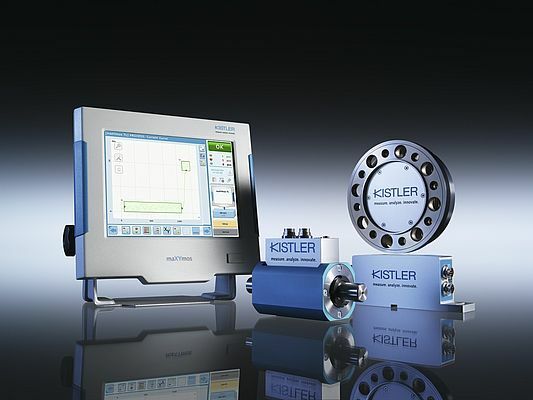 As a leader in the field of measuring and system technology with a wide range of torque sensors, Kistler provides solutions for every application – whether in testing couplings, testing torque to determine screw quality, or testing the push-and-turn caps on nasal sprays. In addition, Kistler's high-precision torque sensors are also used in the field of development; for example, to determine the efficiency of electric motors or friction coefficients at test benches. By gradually expanding its product portfolio, Kistler has secured its reputation worldwide as a lead-ing supplier of sensor systems. Thanks to the innovative development of the maXYmos family in particular, the uniformity of the systems and their simple, intuitive handling are now part of day-to-day industrial manufacturing operations. When testing products, users can access a simple system that enables them to perform various tests quickly and accurately – not only by force-displacement monitoring, but now also by monitoring the torque over time or angle of rotation. With its wide range of interfaces, the system provides an ideal platform for recording a large number of measurands and their evaluation. Thanks to the user-friendly ‘Sequencer Mode’, test sequences can be programmed in the device and analyzed online in real-time. These sequences can easily be parameterized on the device and perform simple control tasks. The maXYmos TL detects defective parts or deviations early in the production process and displays them transparently. This leads to minimized downtimes, optimized test sequences, and improved plant availability. Thus, the integrated process control enables higher quality and lower costs in assembly and testing. Kistler’s sensor technology is not only used in direct product testing in the production process, but also in the test bench field for quality monitoring. The accuracy and flexibility requirements for test systems, i.e. evaluating the efficiency of power train components, continue to grow. Robust, highly accurate torque sensors are particularly in demand for determining friction coefficients and perfor-mance factors. Kistler presented at SPS IPC Drives the KiTorq Type 4550A with angle measurement for the first time. Compared to the KiTorq Type 4551A, this newly developed sensor now enables the measurement of torque, speed, and rotation of angle with an unprecedented resolution of up to 8,192 pulses per revolution. The number of pulses can be freely adjusted to meet the user’s requirements. The torque measuring flange system consists of a measurement body, the KiTorq rotor, and an evaluation unit (the KiTorq stator). For manufacturers of electric and combustion en-gines, drives, pumps and compactors, the system provides wide flexibility thanks to the guideless stator in that measurement bodies can be used without having to completely rebuild the test facility. Type 4503B offers a number of enhanced functions to satisfy current industry standards. For example, optical speed and angle measurement have been replaced by a magnetic one. This means the sensor is now safe and robust enough for use in contaminated industrial environments (e.g., oil mist), which saves valuable maintenance time. Furthermore, the electronics of the torque sensor have been improved. For highly dynamic measurements, Type 4503B also has a cut-off frequency of 10 kHz. Users can customize it individ-ually via an integrated digital low-pass filter, while the second measuring range can be flexibly scaled up to a spread of 1:10. In addition, the Type 4503B is characterized by large measuring ranges from 0.2 to 5,000 Nm, as well as an integrated rotational speed/angle measurement up to 8,192 pulses/revolution and a high-speed version with up to 50,000 rpm. With the KiTorq Type 4551A and 4503B torque sensors, as well as the new KiTorq Type 4550A with angle measurement, Kistler's torque sensor portfolio fulfills all market requirements as these sensors offer maximum dynamics and accuracy for industrial manufacturers. Compatible with previ-ous versions, the new torque sensors can also be integrated in existing systems with minimal effort. The key benefits of the maXYmos monitoring system also apply to the torque sensors presented at the SPS IPC Drives: They improve transparency in the testing process, and therefore boost quality and reduce production costs.